Alice is a 2 week old Warmblood foal owned by Coldstream Park Warmblood Stud, she was foaled early in the morning of the 28th of January. 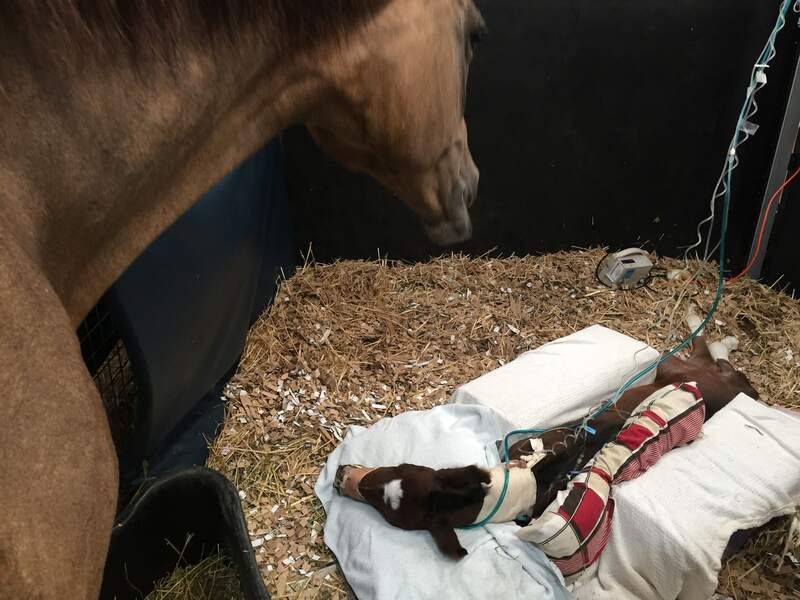 Staff at the stud realised she wasn’t right when she was unable to stand, they immediately rushed the mare and foal to U-Vet Equine Centre, Werribee. Alice went under the care of our specialist medicine team Dr Brett Tennent-Brown, Dr Jenny Bauquier, Dr Cristina Rosales and Dr Nick Bamford who diagnosed her with Neonatal Encephalopathy (Dummy Foal Syndrome). Twenty four hour intensive care was required over the first 5 days of hospitalisation including turning her every 2 hours whilst in recumbency, assisting to stand, nutritional support via a nasogastric tube, intravenous fluid support, intranasal oxygen and antimicrobial therapy. Alice improved slowly and by day 10 of hospitalisation she started to show normal behaviour and suckle from her dam. Alice returned home to Coldstream Park Warmblood stud and was monitored closely by stud staff and her regular veterinarian at Yarra Ranges Animal Hospital. Prompt recognition of symptoms of Neonatal Encephalopathy such as the inability to stand within an hour and the inability to nurse within 2 hours along with admission to a 24 hour emergency care hospital are essential factors in the survival of dummy foals.